I know this is a bit niche & I fully expect it to go colder than my husbands heart (said no to a 4th St.Bernard) but if you have kids like mine, this will make them melt into a heap of jelly! Tefal’s new range has the outline of an unicorn so you can create your own edible art like a pro. This pancake pan comes with a squeezy bottle with a precision tip to ensure your pancakes are drawn to perfection. Simply wait until the pan is at cooking temperature - indicated by the Thermospot that will turn bold red - draw the outline so it has time to brown, before filling in the gaps with the rest of the mixture. Adding a splash of fun to the kitchen, the bottom of each pan has an enamel, glossy finish with a colourful illustration of a Unicorn. The ergonomic handle also ensures that the whole family can enjoy tossing pancakes without fear of burning fingers. Tefal’s new and improved easyglide non-stick coating, which is 50% more effective than previous coatings, will make pancake flipping even easier! The range is also dishwasher safe and compatible on all hob types. 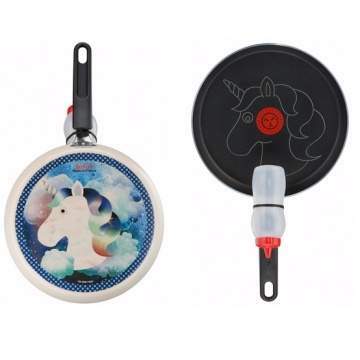 daughter loves pancakes and unicorns how can I not get this! I'm not so bothered about the fun side of this, but am looking for a pancake pan that is non-stick without having to smear it with oil or butter before cooking. Does such a thing exist? It's animal cruelty frying a unicorn. Somebody please call-in the RSPCA! I'm a simple guy. I see ponies unicorns, I heat. 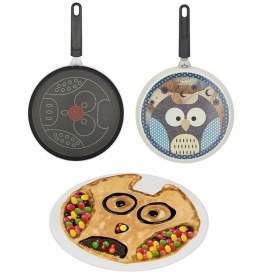 I'm not so bothered about the fun side of this, but am looking for a …I'm not so bothered about the fun side of this, but am looking for a pancake pan that is non-stick without having to smear it with oil or butter before cooking. Does such a thing exist? Definitely get the 4th St Bernard and give it your husband's space in the bed.